Built between 1859 – 1876, demolished 1973; G. F. Bryant, architect. In 1859 a cut was made through Indian Ridge Path to run a drain between Bigelow Chapel Lawn and Auburn Lake. A catacomb tomb was proposed along the sides of the cut with an entrance facing Auburn Lake. The project was ongoing through 1876 and there were many changes as it evolved. Originally intended for permanent burials, it was subsequently designated for temporary interment only. Although the receiving tomb on Greenbrier Path was never discontinued from use, the Auburn Lake tomb became the primary tomb for holding remains until a grave was purchased and ready or the ground thawed. In 1910, Mary Baker Eddy’s casket was held here while her monument was constructed. 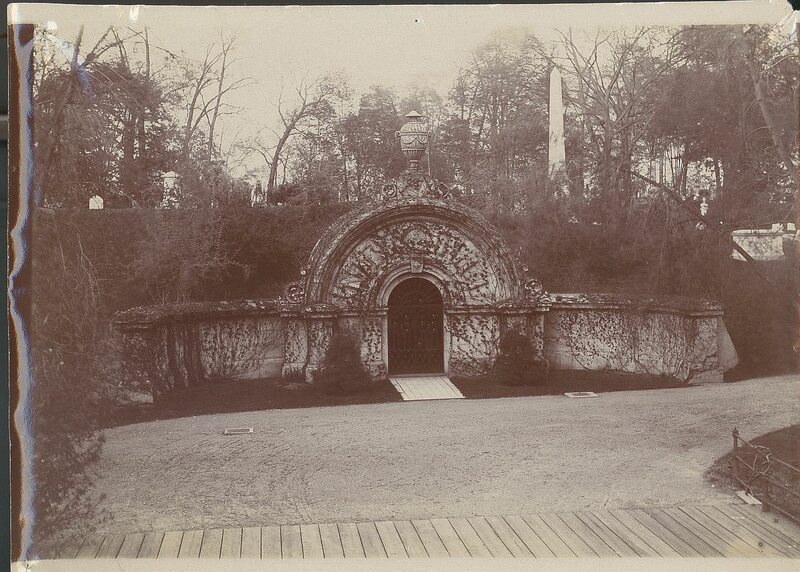 The receiving tomb remained in use until 1973 when it was demolished to make room for Auburn Court Crypts. Adapted from: Berg, Shary Page. Mount Auburn Cemetery, Master Plan: Vol. II, Historic Landscape Report. Cambridge, MA, 1993. Auburn Lake Receiving Tomb, 1905. -ish I believe. Photographed by D. Barnum.